Have you ever tried capers? Today's Wonder of the Day is about capers. And, no, we're not talking about those wild escapades always being planned by villains in cartoons. We're talking about the kind of capers you eat! Throughout the Mediterranean and parts of Asia, you'll find Capparis spinosa, also known as the caper bush or Flinder's rose. It's a prickly plant that grows in dry areas. The unripened flower buds of this plant — called capers — have been used as a seasoning and flavorful part of recipes for over a thousand years. 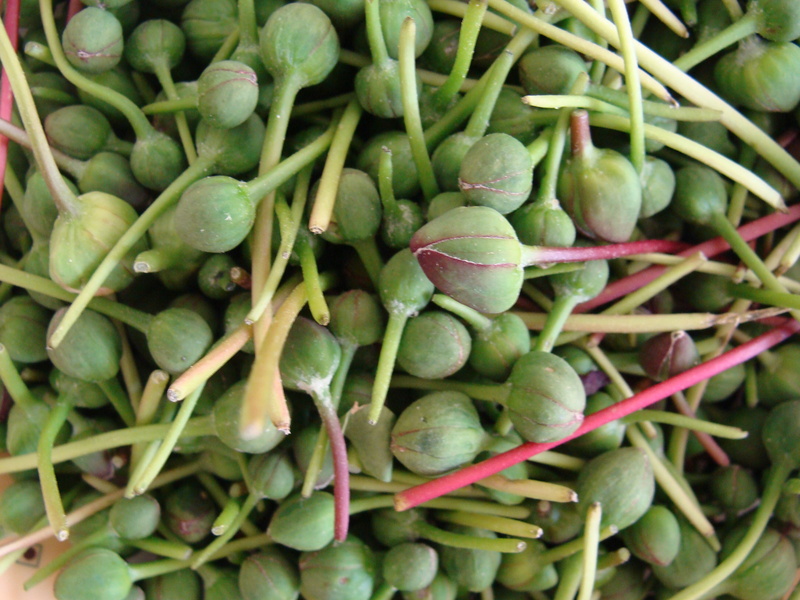 Its ripe fruit, known as caper berries, are also used for food. After farmers harvest the unripened buds, they dry them in the sun. Once they're dried, they pickle them in vinegar, brine, wine, or salt. This process is called curing, and it gives the capers a unique lemony flavor that's somewhat similar to green olives. Capers range in size from tiny (about the size of a green pea) to about the size of a small olive. The smallest capers are the most valuable and often come with a hefty price tag. Capers can be expensive because they're costly to harvest since they're picked by hand. The most sought-after capers are a variety known as nonpareils that come from Southern France. Smaller capers tend to have more delicate flavors and stronger aromas. As capers get larger, they seem to have stronger flavors but weaker aromas. Capers add a salty, sour, fragrant flavor to various dishes, including salads, sauces, vegetables, and meats. Capers are particularly associated with Mediterranean cuisines, including Italian, Maltese, and Cypriot delicacies. You may have also eaten capers as an ingredient in tartar sauce. Make sure you get help in the kitchen from an adult friend or family member. Unless you already have capers in your refrigerator, you'll probably also need to make a trip to the store to get some. Have fun cooking with capers! Have you ever eaten capers? If not, what are you waiting for? Ask an adult to take you on a field trip to your local grocery store to buy some capers to try. What do you think? Do they taste like you thought they would? Do you like them? Why or why not? As you learned in today's Wonder of the Day, capers are particularly associated with Mediterranean cuisine. But what other foods are considered Mediterranean? And what countries would feature Mediterranean cuisine? In fact, what is the Mediterranean and where would you find it? Use the Internet to answer these questions. Share what you learn with a friend or family member. Capers is an organic type of food. It is salty/very salty. I think tomorrow's wonder of the day is about table placements. What is a caper? I think it's sommething to eat at a special occasion. Hi like the article. I hope tomorrow's wonder is about my favorite animal the FENNEC here is my BIG sentence... The Fennec Fox is the smallest fox in the WORLD, only weighing up to 4 pounds it has more chances of surviving. Predictions I think it is a salad, or mozzarella sticks. having or covered with protective barbs or quills or spines or thorns etc. Flinder’s rose is another name for what? aa red rose Not Quite! da species of olive Not Quite! Which of the following can be used to pickle caper buds? Capers are particularly associated with what type of cuisine?